Welcome to Target Golf, a beautiful par three hole set against a dramatic coastal backdrop. Accuracy is the name of the game as the pros and amateurs battle it out to be king of the course. With trees, deep bunkers, heavy rough and open water waiting to punish loose shots, only the most skilful strikers of the ball will emerge victorious. Or will they? Like with a number of our other sports games the first thing you need to decide upon is whether to play a 'rapid' game or an 'in-play' game. Playing a rapid game you place your initial bet and then watch the game play out. With an in-play game you can place more bets between shots but be quick as you only have 20 seconds to confirm between shots. There are three pro players and three amateur players, all with varying degrees of accuracy. At the same stage as you select whether to play a 'rapid' game or an 'in-play' game you will be given the opportunity meet the players. 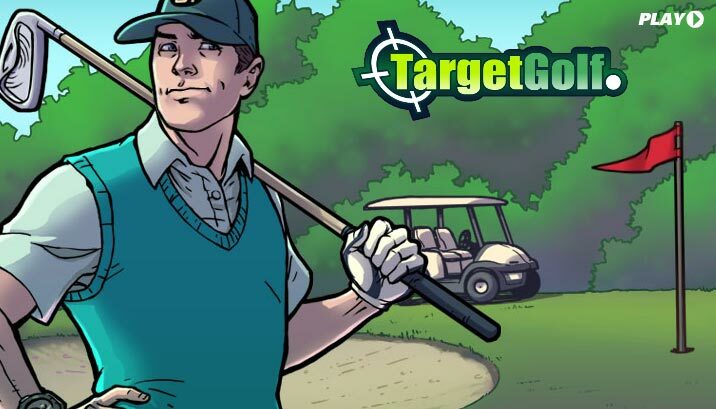 By clicking through to this you will be able to see the accuracy percentage of each player as well as some probability information – namely the number of times each player will hit an area on the course from 1,000 shots. For example the number of times you would expect Tiger to get a Hole in One from 1,000 tries.